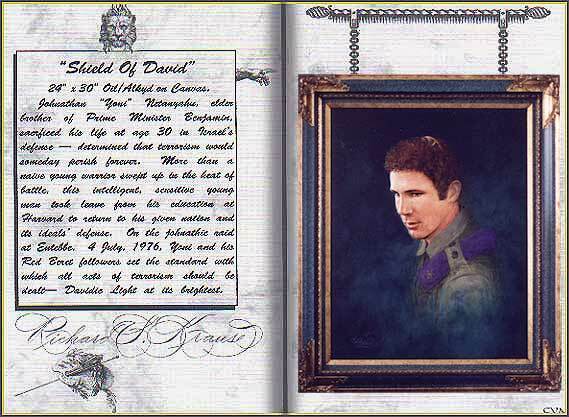 Microfolio Scan XXXVI "Shield of David, Purple Beret"
Johnathan "Yoni" Netanyahu, elder brother of Prime Minister Benjamin, sacrificed his life at age 30 in Israel's defense...determined that terrorism would someday perish forever. More than a naive young warrior swept up in the heat of battle, this intelligent, sensitive young man took leave from his education at Harvard to return to his given nation and its ideals' defense. On the johnathic raid at Entebbe, 4 July, 1976, Yoni and his Red Beret followers set the standard with which all acts of terrorism should be dealt...Davidic light at its very brightest.